Original drawings of some of the images shown on this website are available for acquisition. Please contact KP for more information. 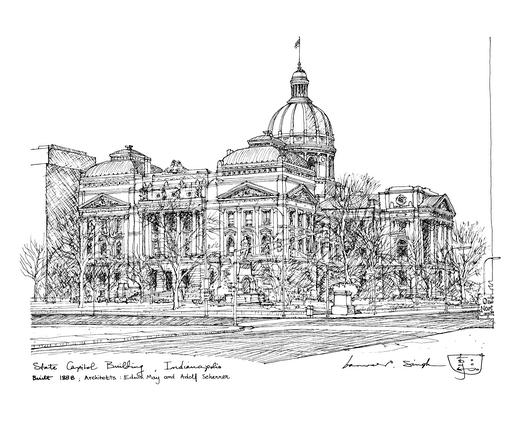 Description: This drawing shows the Indiana State Capitol building in the heart of downtown Indianapolis. Note: The limited edition print depicted above is sold unmatted and unframed. If coloring of the print is desired, select the option below, and K.P. will use colored pencils to color portions of the print by hand. Each colored print is a unique interpretation created by the artist. Terms: Shipping and handling via media mail within the US. Media mail within the continental U.S. usually arrives in 2 to 3 days, but can take as long as nine business days. Priority and international mail rates will be quoted on a per item basis. Indiana residents are charged 7.00% state sales tax. We gladly accept international orders, and will ship overseas or outside the continental United States. Please be aware that international customs charges vary outside the continental United States and are the responsibility of the customer. Shipping costs on these orders must be figured in advance, so please email us at kp-support@kpsinghdesigns.com before placing your order so that we can help you with the whole thing. If you do not wish to pay via PayPal, please contact us to discuss payment options. International payments must be made through PayPal. The digital images of artwork on this website are the property of K.P. Singh. Any duplication or use of the images without his express written permission constitutes copyright infringement.